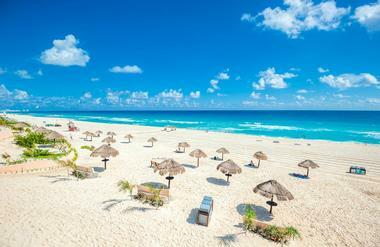 Cancun is a popular escape for many visitors from cold climates. It is known for its warm weather and water and its many resorts. Most people visit in the winter and early spring between the months of December and April. This is peak season so Cancun will be crowded. 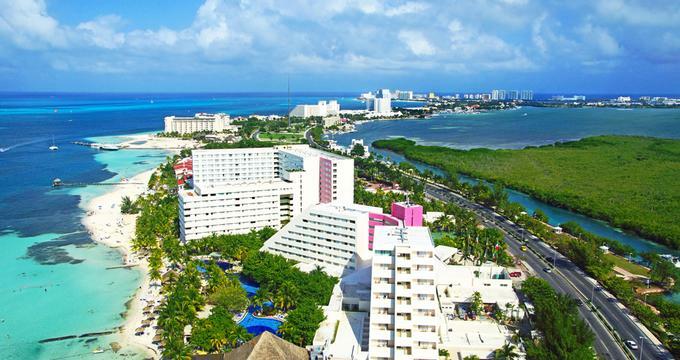 But even with the crowds, the weather is perfect and, contrary to what you might think, room rates and airfares are affordable, making winter and early spring the best time to visit Cancun, Mexico. Avoid Cancun during the period between mid-March and early-April - this is when spring break brings huge crowds to Cancun. Cancan can be extremely hot during the summer while significant storms can hit during the fall months. January is Cancun’s coolest month of the year with the high temperature peaking at 82°F (28°C). The low temperature is mild at 70°F (21°C). In February, Cancun receives a 9-hour average of daily sunshine. This comes with an increased average high temperature of 84°F (29°C) while the average low temperature holds steady at 70°F (21°C). March sees the average high temperature rise another few degrees to 86°F (30°C). During this month, the average low temperature also increases to 72°F (22°C). Cancun Weather in April: It’s a dry month in April with the lowest precipitation rate of the year at 27mm. The high temperature and the low temperature both continue to increase and range between 90°F (32°C) and 73°F (23°C). In May, the average high temperature increases a single degree to 91°F (33°C). This coincides with the highest daily average of sunshine for the whole year at 11 hours. Meanwhile, the low temperature gets bumped up a few degrees to 75°F (24°C). June’s high temperature average holds steady at 91°F (33°C) while the low temperature average increases a few degrees to 77°F (25°C). In July, the average high and average low temperatures remain constant at 91°F (33°C) and 77°F (25°C) respectively. July is arguably the best month to hit the beaches with an average sea temperature of 84°F (29°C). Cancun Weather in August: The hottest month of the year in Cancun is August as the average high temperature climbs to 93°F (34°C). Low temperature averages remain at 77°F (25°C). September is the year’s wettest month with precipitation levels at 270mm. High temperature averages measure in at 91°F (33°C) while the average low temperature holds steady at 77°F (25°C). In October, the climate takes a dip with the average high temperature and the average low temperature at 88°F (31°C) and 75°F (24°C) respectively. November gets rainy in Cancun with precipitation rates at 270mm. The high temperature average decreases slightly to 86°F (30°C) along with the low temperature average which goes down to 73°F (23°C). 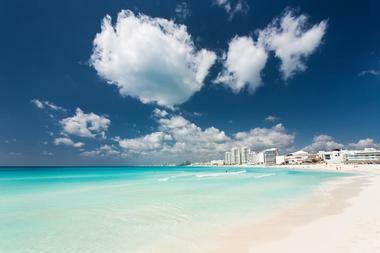 Cancun Weather in December: The average daily sunshine of December is the least in the year at 8 hours. This is matched by the second coldest temperatures of the year with the average high temperature at 82°F (28°C) and the average low temperature at 70°F (21°C). If you’re visiting Cancun with the intention of catching the best parties and meeting other party-going travelers, make sure to visit during the peak season from December to April. For the least number of tourists, plan your visit in between the months of May and June as well as September and October. The best deals and discounts can be enjoyed in the late spring. Make sure to avoid the late fall months, however, as this is the time that is most prone to bad storms. Many international visitors arrive by airplane at the Cancun International Airport at the southern tip of Cancun’s Hotel Zone. The airport is located 12.5 miles from the center of the Hotel Zone and 12 miles from the Ciudad Cancun, or the city of Cancun. There are nearly ten car rental agencies at the airport. The SuperShuttle transports visitors from the airport to the Hotel Zone or to the Ciudad Cancun. There is an inexpensive local bus that runs between the airport and the Ciudad Cancun. There are also taxis available at the airport. By car you can reach Cancun from Merida or Campeche by car using Highway 180. You can also arrive by bus from several points in Mexico. There are several ways to get around Cancun, but traveling by bus is the best way. It stops frequently along Boulevard Kukulcan in the Hotel Zone and on Avenida Tulum in the downtown area. The one way fare is very inexpensive and you can easily flag down a bus. Buses require Mexican currency. Bus One is air-conditioned so it is a little more comfortable. Taxi fares seem expensive when compared to the bus fares, but in reality taking a taxi is not all that expensive. Ask your hotel to call for a taxi if you need one. Driving a car can be a bother because of traffic congestion and because police often ask for bribes. As an international tourist destination, Cancun offers a wide range of restaurants. There are fine dining restaurants: Cancun has three AAA Five Diamond restaurants. Fish and seafood restaurants abound in Cancun: fresh lobster is the specialty at many of these restaurants. 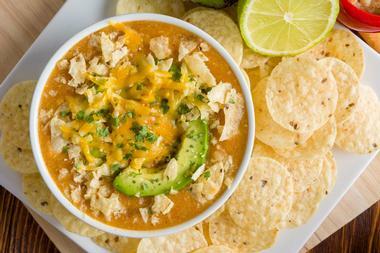 There are also many Mexican restaurants in Cancun, but don’t expect the Tex-Mex food that many people consider to be authentic Mexican cuisine. Cancun, on the Yucatan Peninsula, serves Mexican food that is a blend of Mayan and European flavors: ingredients come from local sources. In the downtown area you will find a variety of steakhouses, famous chain restaurants, and eateries serving ethnic cuisine from Asian to Argentinian and everything in between. Cancun is known for its beaches, hotels, and fine weather, but there are many shops and malls in Cancun. Handicrafts make popular gifts and souvenirs, but keep in mind that they are not made in Cancun and tend to be more expensive than in the other parts of Mexico where they are made. 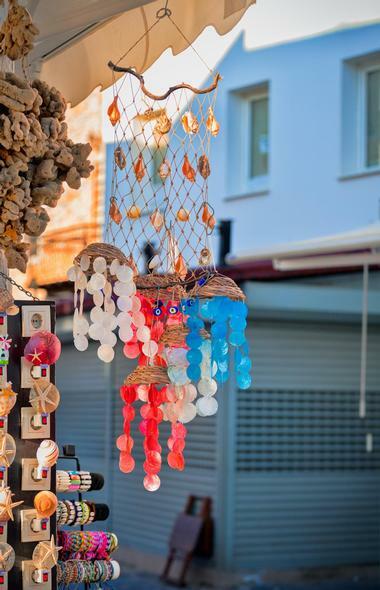 Handmade items can be found at open air markets: the best one is the Mercado 28 in Ciudad Cancun. Plaza La Fiesta is another open air market and sells things such as accessories, handicrafts, jewelry, leather, and much more. The Kukulcan Plaza is a mall with hundreds of shops and restaurants. The Plaza Caracol is another mall and is located near the Convention Center. Cancun is a 14 mile strip of sand on the Yucatan Peninsula that is full of beaches, resorts, and much more. Even though it is a relatively small area, it is made up of three neighborhoods. Cuidad Cancun, or the city of Cancun, is a small resort city that is the home of more than 150 hotels and other businesses. If you want to explore Mexican neighborhoods, these can be reached by bus from downtown Cancun. The Hotel Zone’s main thoroughfare is the Boulevard Kukulcan. Like Cuidad Cancun, the Hotel Zone is full of resorts and hotels. Many visitors hop on a ferry to the nearby Isla Mujeres. This is an island and small town eight miles northeast of Cancun. 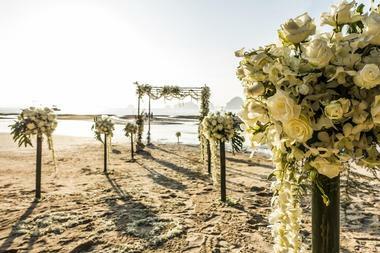 Beautiful Cancun is a popular place to get married and there are many stunning wedding venues. Both Mexicans and non-Mexicans can get married in Mexico. Because there are so many hotels and resorts in Cancan, this is where most weddings take place: but the good news is that these properties vary so much one from the other, you’re sure to find the perfect venue for your wedding. Some of the hotels and resorts include the Westin Resort and Spa, the Gran Caribe Real Resort and Spa, Paradisus Cancun Resort, and many more. Other options include the Zoetry Wellness and Spa Resort, the Arenika Beach Club, Ocean Weddings, and others. There are so many fantastic hotels and resorts on Cancun that it’s hard to make a choice. The Hotel Zone stretches for 17 miles along the Caribbean Sea, and there are over 32,000 rooms in Cancun. Cancun offers romantic luxury properties for honeymooners to budget accommodations in the downtown area. 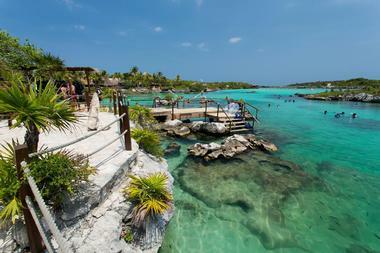 Many hotels and resorts in Cancun are all-inclusive, while some have European plans. Luxury hotel properties include the Ritz-Carlton Cancun, the J W Marriott Cancun Resort and Spa, Le Blanc Spa Resort, Live Aqua Cancun, and many others. 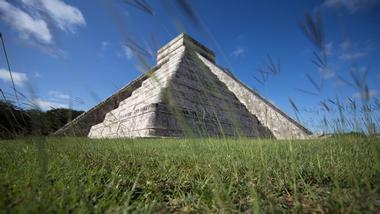 Most major chains have properties in Cancun and it is a popular package destination. There are also rental properties including condos, homes, and villas.